As of early May 2017, the Bexar County District Clerk’s office has made some additional and pretty major changes to the Officer’s Return portion of their Citation. 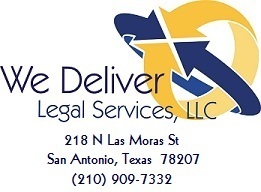 If you’re a process server in Bexar County, the clerks probably mentioned to you when you picked up your issued Citations, to make SURE to completely fill in all of the blanks on the Officer’s Return, specifically making sure that you list ALL the documents attached and delivered along with the Citation. I have provided a copy of the new Officer’s Return below. Any time our District Clerk’s make significant changes to their forms, processes, or procedures, I believe it’s our job as professionals try to make sure that our servers are completely clear on what exactly they need to do to comply with what the court has changed. Since the clerks in Bexar County made such a point to tell us to make sure we fill in all the documents being delivered, I inquired a little further into the matter for a clear understand of what they expect. The clerks who prepare and issue these Citations are supposed to type the pleadings attached, and they do. However, sometimes, the clerk just types “Petition” instead of “Petition for Divorce”. It is my understanding that there have recently been some over-turned judgments based on the Officer’s Return only showing that the Citation was delivered, without proper notation of the specific pleadings attached. Whether this was the fault of a clerk who simply typed “Petition” instead of specifically listing what petition, or an error made by the process server, we aren’t certain. However, we can be certain that from this day forth, if the process server does not specifically list all documents delivered along with the Citation, your service could be found invalid. I did get a clear response from a supervisor in the Bexar County District Clerk’s office, affirming that if you prepare and attach an Affidavit of Service to these returns, the clerk will still accept those. I was specifically told to make sure that the Affidavit of Service specifically listed all of the documents delivered along with the court-issued Citation. Thankfully, it has been my policy and practice for years to attach an affidavit of service, and we always list every document included with the service. But, I know that there are many process servers out there who still like to fill out the Officer’s Return by hand. I hope this gives you the head’s up in the instance you are serving a Bexar County Citation. Update as of June 20, 2017: It seems that the Bexar County District Clerk made some additional revisions to the Officer’s Return in June 2017. 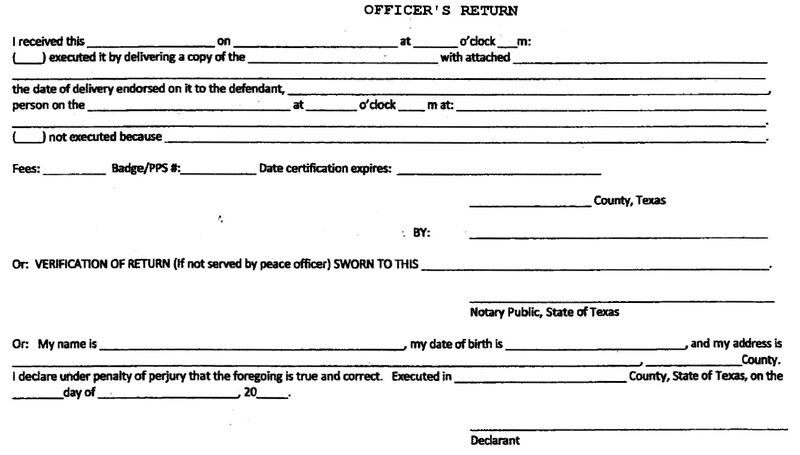 Below is the updated revised Officer’s Return, which now has the specific documents being served typed within the return. 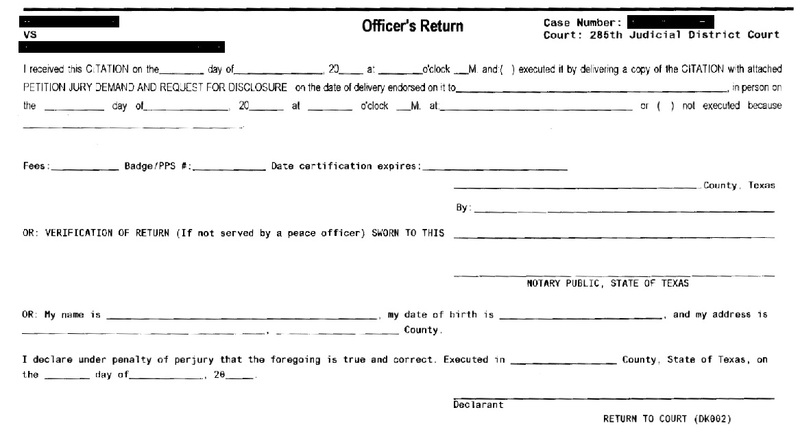 It is still recommended that process servers make sure to verify that the pleadings attached to the Citation are exactly what is typed onto the newest Officer’s Return, because when we sign that return, we are swearing that we’ve delivered exactly what the clerk has noted that we’re delivering. If there are any discrepancies, they should be pointed out to the client and/or the clerk before proceeding with the service. An additional change is the addition of the style of the case, case number, and court to which the case is assigned printed on Officer’s Return, itself.